We all want to be happy. We want wonderful marriages; but when we intend to improve a connection, we fail. Three common obstacles interfere with our wonderful intentions. Many, if not most, relationships stumble on critical junctures. Often, no more than a passing thought; sometimes, an organized presentation of options and reasons to a professional. “Should I stay, or should I leave?” Our partners may flush with a mix of anger and fear, knowing the non-sense floating through our minds. Unless, of course, at that same moment, they are entertaining the same wonderings. Usually, such thoughts are simply silliness, the mind dodging the work of relating with another dynamic human being, a person we have invested time and energy with to build a life together. Once we excuse the question as foolish, and settled on the logical choice of staying, we must get to the essential work of strengthening and repairing the relationship. Fantasies of something better, often are just mirages glimmering against the arid backdrop of a neglected relationship. But the sweet waters of a better relationship, with someone we barely know, usually fail to materialize into the grand plans we envision. Most relationships eventually encounter the critical juncture—should I stay, or should I leave? Many people chase the paradisaical relationship their entire lives and die alone. Others take a pugilistic stance and stay in a relationship that will never bloom, suffering the repeated blows of disconnection and aloneness. But before engaging in a never-ending chase for something better, almost all established relationships deserve a chance to mature with a little attentive effort. Troubled relationships on the brink of collapse can still be salvaged; but not always. Sometimes the hurts are too deep and too many. The patterns of engagement are carved deeply into the character of the relationship and change stubbornly resists. Other times people are just not compatible. The individual collection of fears, joys, expectations and needs do not mesh, and the couple is destined for divorce or misery, neither able to satisfy the other without completely denying their own individuality. But many can change. 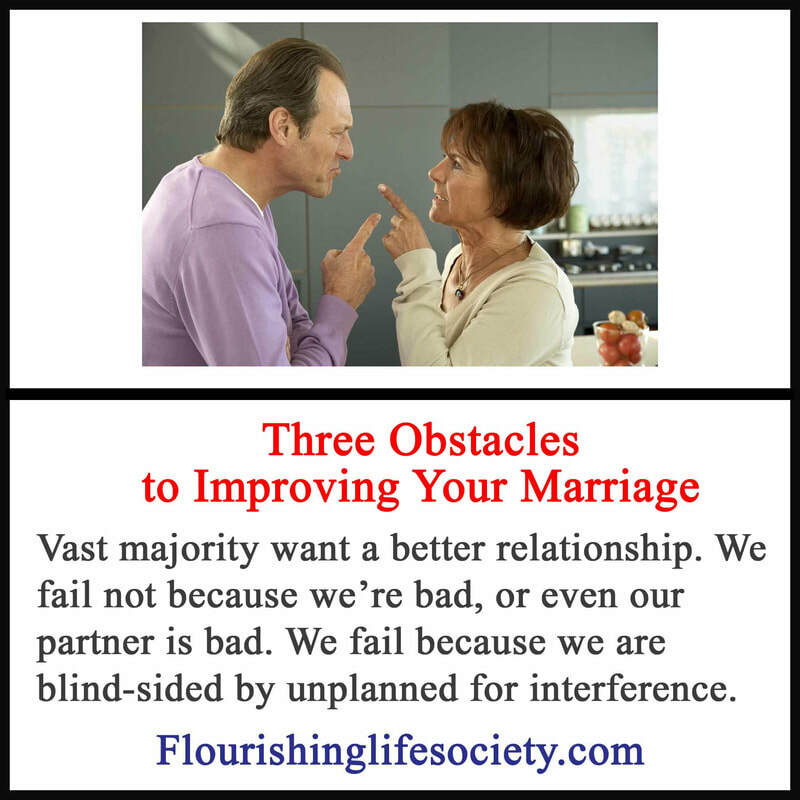 Three major obstacles interfere with desire to improve a marriage. The first obstacle is the success and failure of a relationship is not dependent upon the work and desires of a single person. Two people are involved. Two people are engaged in the destructive pattern. There are many things we can do to improve our contributions to the strength of a relationship. Some of our changes may encourage changes in a partner. But our partner remains an individual, not to be manipulated or cajoled into joining in the relationship improvement mission. They may be perfectly satisfied with the dysfunctional relationship just the way it is. Our efforts are not for naught. We improve as a person, develop greater relationship skills and eventually move on. "Two people are involved. Two people are engaged in the destructive pattern." The second obstacle that halts honorable intentions to improve is the blinding and distorting influence of subjective evaluations. Relationships are the greatest external power on emotions. A partner’s acceptance or rejection cuts through the false outer layers and shakes our soul. We adapt to the emotional storms of relationships in many healthy and unhealthy ways. We misuse the power of cognition to regulate the painful emotions of disconnection. We perceive ourselves as saints, righteously giving to improve the relationship, when all objective evidence suggests otherwise. When a partner raises their tone and pitch to compete with our yelling, we are incensed that they are yelling at us. When a partner protects or retaliates against our punishing strikes, we cry foul. We frame the problems of a relationship the way we want them to be. Most visits to marriage counseling isn’t to save the marriage but to gain an ally of a paid professional to join in our illusion of victimization. “Please,” we demand, “tell my husband that he is wrong.” In the sea of subjective self-pleasing meanings, the reality of personal contributions drowns. Many are completely dismayed that the devil they were once married can establish a healthy and happy marriage with someone else. The only protective step left is to attack both the ex and their new stupid spouse. The third troublesome obstacle that impedes improvement is the bewildering amount of faulty information. We live in an age of information overload. The internet is ripe with misguidance. The driving force behind Google searches in not a list of scientifically proven remedies; but a list of results, determined by complex algorithms, that are most likely to be welcomed—simple lists, promised outcomes, and delightful reads. An article more likely to go viral is more important to business than an article that will improve your relationship. Information that assuages the ego, stroking subjective meanings by pleasing unrealistic intuitions, spreads across the webs of social media much quicker and further than scientifically proven methods that demand uncomfortable self-examinations and lengthy commitments to change. Unfortunately, faulty advice isn’t simply ineffective but often counterproductive, encouraging faulty adaptations to inabilities to connect (Lauding Unhealthy Adaptations). The misinformation commonly associated with the internet spills over into many other sources of support. Books are not peer-reviewed for accuracy, in-line with current findings. Even well-meaning, educated authors slowly bend to what sells rather than what helps. Dr. Phil slowly transforms becoming more and more like Jerry Springer. The late Dr. Wayne Dyer drifted more and more towards the likes of Eckart Tolle. The growing body of therapist fighting over new clients are likely to rely on more attractive presentations than statistically supported methods. Fluffing their practice with the wisdom of best sellers instead of peer-reviewed articles. The good news is we can navigate around these obstacles. We can work together with a partner towards a common goal of a successful marriage. Many partners desire the same end goal—an enjoyable, satisfying marriage. We can discern reality through the smoke screen of subjective interpretations by mindfully allowing alternate explanations to percolate before acting on the first pleasing speculation of cause. And with a little effort, we can become familiar with current research on human bonding and connection, exposing the fluff from the artistically pleasing. Heed the warning of the critical junction ahead, take your foot off the accelerator, be attentive to avoid the pesky obstacles, and skillfully navigate your away through the non-sense and to the fulfilling relationship you desire.